Discover new products. Open new markets. WEGOTRADE’s Open Marketplace gathers buyers and sellers of the food industry on a single platform, enabling fast, secure and simple trade between them. 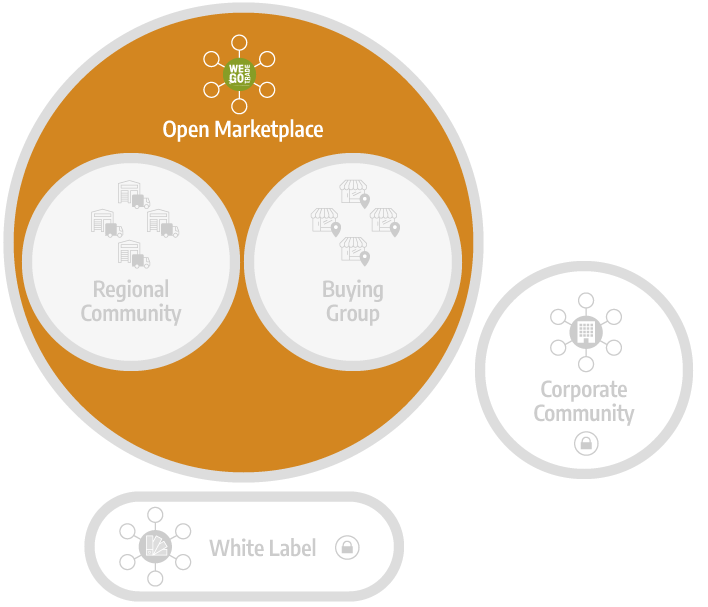 The Open Marketplace, as its name suggests, allows members to trade freely, to open new markets, and to create new business opportunities. Vendors benefit from an increased visibility and exposure, while retailers can access multiple catalogs and receive promotions in real-time. We understand the challenge of ordering from many different platforms, making phone calls, sending faxes, connecting to one website and trying to remember the login of another, scanning some products and manually writing the rest on your purchase order, training your staff to use proprietary systems, while you hope to get the right products on time to keep your sales going. WEGOTRADE’s marketplace is the solution the food industry has been waiting for. Retailers can finally purchase from multiple vendors through one single process. Joining the Open Marketplace on WEGOTRADE is FREE, and it offers restaurants owners, franchisees, grocery or convenience store owners, as well as other retailers a totally different way to manage their purchases and inventory, while opening up to new business opportunities. Buyers can place, track and manage their purchase orders to multiple suppliers from a single place, using our mobile app or our user-friendly web interface. Discover new products, connect with new vendors, and get notified of ongoing promotions in real-time. WEGOTRADE’s Open Marketplace is a time-saving tool that helps retailers streamline their order process. No more faxes, no more waiting on the phone, no more waiting for a sales rep to place an order. Besides, because the Open Marketplace connects you to multiple vendors, there’s no need to learn and adapt to different ordering systems. Open the app, find the products you need, and order! The Open Marketplace already is the go-to solution for thousands of other companies. Join today and make you business simpler! Publishing your products catalog on the Open Marketplace is a fast and efficient way to boost your sales! Our Open Marketplace is the new way to do business for distributors, suppliers, brokers & wholesalers of the food industry. Vendors have full control over their catalog. It can be published and made available for all retailers on our Open Marketplace, or be personalized for each selected business customer in order to control multiple prices. Vendors can also publish their catalog only for a specific region. In other words, your existing customers can place purchase orders more easily. On the other hand, you start doing doing business with dozens of other companies interested in buying from you. WEGOTRADE’s Open Marketplace connects buyers and vendors, acting like a B2B hub and facilitating transactions. It offers advanced tools and features. It has a capacity to connect to your existing order management system. WEGOTRADE is a no-nonsense solution to today’s challenges in the food industry! GET NOTIFIED OF NEW FEATURES AND UPDATES. SUBSCRIBE TO OUR NEWSLETTER TODAY! I agree to receive emails from WEGOTRADE. I understand that I can unsubscribe at any time. © 2019 WEGOTRADE, Inc. All Rights Reserved.